Find the perfect towbar bike rack packages from the range of options we have available. Towbar Mounted Cycle Carriers are a safe and secure way of carrying up to 5 cycles on the back of your car. 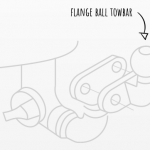 Some cycle carriers are bolt-on carriers which means they only fit on flange style towbars, however the clamp-on cycle carriers will fit on both flange and swan neck towbars. Towbar and Bike racks are often purchased together to ensure the correct towbar is purchased. When you purchase the two together out fitters will assemble and fit the cycle carrier at the same time as fitting the towbar and show you how they work. Towbar mounted cycle carriers are much stronger and more secure than carriers that strap to the tailgate of your car, any risk of damage to your car is virtually eliminated. 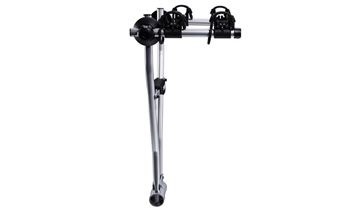 There are two types of Cycle Carriers available; stand-on carriers and hang-on carriers. Both connect to the towball and allow up to 5 cycles to be carried. If you are unsure which way to go then please call us or email us for more information. We source towbars from all of the largest towbar manufacturers, these are the same companies that make towbars for the car manufacturers, and are fitted as original equipment. We never simply look for the cheapest option; we prefer to find the best fitting and tidiest towbar available for each application. There are 2 styles of towbar available. 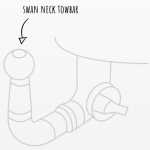 You can choose between either a flange ball towbar, where the towbar has a faceplate with the towball bolted to it, or you can get a swan neck towbar which has a one piece neck with the towball attached. Either option can be available as a detachable option where the neck can be removed from the towbar when you are not using it. If you're not sure about the style of towbar that you need, simply click below to learn all you need to know. Our towbar bike rack packages can be accustomed to suit your needs. You can choose from our range of bike racks to suit your towbar. What cycle carrier is best for you? You can choose between a Hang on Carriers or Stand on Carriers. 'Hang On' Cycle Carriers support bikes from the top, usually by hooking through the frame. The main advantage of this type of carrier is that when they are used with a flangeball type towbar the towball is left free so that you can still tow at the same time. However, you do need to make sure that there is enough clearance between the bikes and what you are towing. They are also generally cheaper, and more compact for storage than the 'Stand On' type carriers. The downside is that they are not as secure as 'Stand On Carriers'. 'Stand On' Cycle Carriers support bikes from below, they are the most secure way to carry bikes on your car. The advantage of this type of carrier is that the bikes are securely support from below by the wheels. The bikes are secured to the rack so that they can not move around so they won't damage your car. The downside is that they are more complex, and therefore more expensive than 'Hang On' carriers. They are also heavier and larger, so they are more awkward to store when not in use. 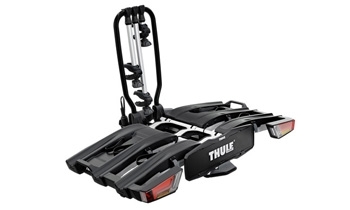 We stock a range of accessories to go with your cycle carrier. Extra Bike Adapters - We have Thule and Cykell bike adapters to enable an extra bike to be added to certain cycle carriers such at the Thule VeloCompact and the Thule VeloSpace XT. Loading Ramps - These are convenient removable ramps for easy loading and unloading of your bikes to save lifting heavy bikes. Carrier Bags - Protects you and your car from dirt when transporting and storing the cycle carrier. Holds the whole cycle carrier in a convenient transportable bag for use in your car or garage.